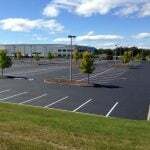 While asphalt is a very strong and durable material, it is still affected by the elements. Understanding how changing seasons and changing weather patterns can distress asphalt pavement in different ways is important for pavement care and damage prevention. Asphalt is actually sensitive to both cold and hot temperatures making year-round care extremely vital. While summer generally causes little damage to your asphalt, the high heat and sun do cause some distress to your asphalt surface. Sun and penetrating UV rays can lead to asphalt fading and surface damage/cracking. Severally hot weather can even cause the potential for soft spots in your asphalt. Seal your pavement every 2-3 years to protect against sun damage from UV rays, reduce the rate of water permeation, and to give your lot an aesthetic “face lift”. Winter is the single most damaging season to your asphalt. Not only does the freeze-thaw cycle distress and crack your pavement, but your asphalt is also dealing with other extremely harsh components of winter like plows and salt/ice melt products. Frost Heave – When freezing temperatures penetrate the ground they can cause subsurface water to form ice structures. Freezing below the surface displaces the soil and traps water in voids below the ground. During underground freezing, expansion occurs raising surface structures – and then thawing, slamming structures back down unevenly. Learn more about frost heave and your asphalt. Freeze-thaw Cycle/Temperature Fluctuations – When water freezes it expands requiring more space to exist. 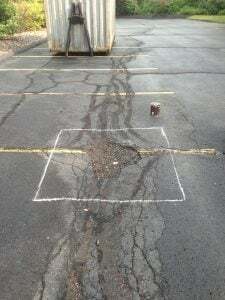 If water manages to find its way into cracks and crevasse of your asphalt, asphalt pavement damage will occur during expansion, as this ice will put pressure on the asphalt above it; creating large cracks and potholes. In winter, it is common for temperatures to fluctuate quite a bit from below freezing to above, as the days progress, encouraging the freeze-thaw cycle daily. Water – Snow accumulation results in large amounts of moisture laying on your asphalt surface, and possibly entering its base if water can penetrate through cracks. Such a high volume of moisture often leads to improper draining and wearing of your asphalt. Deicer & Plows – While deicers do not actually contribute much to deterioration of asphalt alone, they contribute to keeping water in liquid form even when temperatures are below freezing, which means that the freeze-thaw cycle can occur at all temperatures – not just during periods of fluctuation. While snow plowing is necessary and life-saving, any piece of equipment that scrapes against your asphalt pavement surface can distress asphalt. The highest damage areas from plows are typically where the surface is uneven and curb areas. 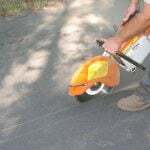 It is absolutely key to make sure that all pavement cracks are filled and that your pavement is seal coated prior to winter to help it to withstand the harsh conditions better. 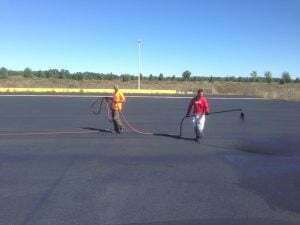 By repairing asphalt cracks with hot rubberized crack filler, you are helping to counteract the effects of the freeze-thaw cycle, because this rubber filler is flexible. Winter asphalt damage is almost inevitable, so going into winter with untreated cracks is essentially asking for major asphalt damage. Make sure that plow blades have a rubber polyurethane cutting edge to limit impact. Set plow blades to ½” above surface. Consider sand as a deicer instead of rock salt. Have a temporary plan of action for major winter damage (like a cold patch) until you can provide a more permanent fix come spring. Dry weather does not do much to distress asphalt. However, if dry and extremely hot, buckling and cracking can occur. See above measures to help with heat and sun! Water and asphalt do not get along – this we know by now. So, during wet weather, especially during times of continuous showers, your asphalt can see much distress. When water seeps towards and into the base of an asphalt lot or driveway, it damages and weakens the base. If this is happening every time it rains, its structural integrity is becoming compromised, putting your entire asphalt surface at risk. Pooling and continued water exposure can lead to large cracks, structural damages, and potholes. 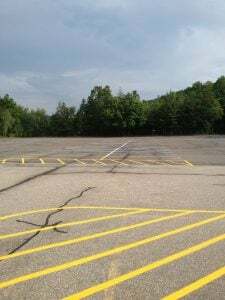 Make sure that your lot and/or driveway has the proper drainage allowing you to dictate where to channel water to remove it from your asphalt surface, and help to avoid pooling/puddling. 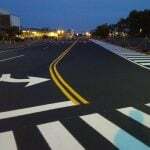 Proactively and regularly maintain your asphalt with crack filling, pavement repairs, asphalt patching, and sealcoating. Invest in durable asphalt pavement repair methods like saw-cut and patching vs. a cold patch (temporary winter Band-Aid). When the hard-to-predict wrath of Mother Nature is involved, it is important to be educated on, and prepared for all weather scenarios and seasons and how it can distress asphalt. Do not procrastinate your asphalt repair and maintenance, and plan ahead to avoid unexpected weather changes! Regular inspections, repair, and maintenance is the most proactive and best way to maintain your asphalt pavement and ensure that it does not deteriorate sooner than it should. 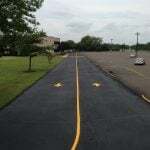 EastCoat Pavement Services is your reputable contractor for proper asphalt installation, effective repairs, and operational maintenance schedules. Prior to season changes, contact us for your free consultation, and be sure that you are ready for whatever Mother Nature has in store!